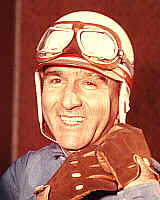 Farina took the first-ever World Championship for drivers. At the Argentine GP 1953 Nino swerved to avoid public crossing the track but skidded into the crowd on the edge of the tarmac. Ten people where killed - many thought the actual number was much higher - more than three dozen more were injured. Farina escaped with leg injuries and the race continued the the end. Mille Miglia 1954 he crashed, he recoverd only to burn his legs badly in a accident at Monza. Came back 1955 but needed morphine to race at the Argentine GP. His injuries forced him to retire at the end of the season. Nino made a half-hearted attempt for a comback in 1956 where injured again at Monza. After Keith Andrews died in his car at Indy he retired for good. Died in a fatal traffic accident on his way to visit the French GP, he was the adviser & driving double for Yves Montand, who played a Ferrari ex-World Champion in the movie 'Grand Prix'.